There is a lot of value in knowing how a bank is doing compared to their metro area. Unfortunately metro area banking statistics aren’t the easiest thing to find. The FDIC creates peer groups based on asset size or state. As far as I know there is no way to find a FDIC peer group based on other banks located in the same metropolitan area without creating a custom peer group. The problem with custom peer groups is you have to know all of the banks in a metro area to build a comprehensive database. The value in this data lies in the ability of a bank to compare itself to the local market. Fourth quarter results should be out and posted here soon as well. This entry was posted in Uncategorized on February 17, 2014 by ntobik. Investors come in two types, the ones who will look at financials, and the ones who won’t. If banking is your forte I would encourage you to read the paragraph on my approach then come back for my next post. If banking is intimidating or difficult to understand hopefully this post will be educational and break bank investing down into easy to understand pieces. The bank I use as an example is not a good investment, but I’ll cover why. I think readers will understand how to analyze a bank better by understanding what’s bad about banks instead of showing a perfect banking investment. If anyone thinks I’m long winded something to consider; this post is based off a presentation I gave to my company and I covered this material in under four minutes, I can condense when I need to. My approach to bank investing is very similar to my approach to buying any other cheap stock. I prefer to buy banks at 2/3 of tangible book value and sell when they approach 1x tangible book value. There are many banks trading at or above tangible book value, and a bank that’s profitable should be trading above it, yet many don’t. A lot of stocks trade below TBV due to management mis-deeds, or the inability of a company to earn their cost of capital. I believe the reason for bank cheapness now is different, we just went through a banking crisis and banks are still considered toxic investments. Beyond this the market has lost interest in smaller community banks conduct the boring business of gathering assets and re-loaning the money. Many of these community banks emerged from the crisis unscathed, and in a lot of cases overcapitalized and trading at incredibly low valuations. Unfortunately market psychology doesn’t care much about this, the banks are still considered risky. Banks are very simple, they gather money in the form of deposits then they loan that money back to those same people and collect interest on the loans. 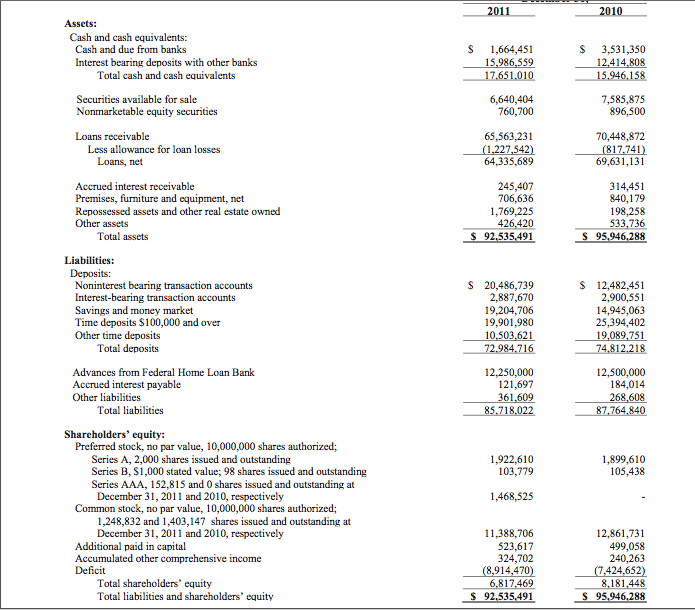 Bank financial statements are a bit strange to look at because we think in terms of ourselves most often. A person’s asset might be cash, which deposited at a bank is a liability. A liability to a person such as an auto loan is an asset to a bank. The assets and liabilities are flipped from what you are used to seeing on a normal financial statement. The good news is you only need to learn this once, all banks report in the same manner. One thing that’s interesting about banking is how sticky customers are. For how commodity the bank industry is many banks have what might be considered a moat. Bank switching costs are high, it’s very difficult to open and close an account, and most customers don’t consider it worth the hassle. I opened an account at a bank a few months back and took my son with me thinking it would be a quick errand. He’s three years old, I could count the time it took to open the account by the number of Dum-Dums he ate while waiting, hint his mother will never know the true tally. I think from start to finish it was about 45 minutes, that time alone is an impediment for customers to switch accounts, not to mention having to switch billpay and auto-draft numbers. The bank in this example is Atlantic Bancshares (ATBA), which is a tiny bank located in South Carolina. The bank has some issues with bad loans which you’ll see in a few minutes, but the valuation is attractive. The bank has equity of $7.2m and is currently trading with a market value of $1.4m, or 19% of book value. The bank publishes their annual reports on their website, with the most recent update from the summer. I’m going to use last year’s annual report for this example, it’s a little outdated, but it doesn’t matter much, the principles are universal. The structure of any company’s balance sheet is important, small differences on the balance sheet can mean the difference between profit and loss. Starting at the top the first thing you’ll notice is cash and cash due from other banks. Banks hold cash and securities against their regulatory capital requirements. An item worth noting with this bank is they have a lot of cash but not many marketable securities. The cash is earning them nothing, where securities might be earning something. Securities are counted against capital differently than cash, which can drive the composition, all things being equal interest bearing securities are better than cash. I like to scan a bank’s liabilities first when initially looking at an investment. A banks funding base is the first indication of profitability. The ideal bank setup is one where the funding base is non-interest bearing deposits that can be re-loaned at much higher rates. Commercial lending falls under this category, most businesses that borrow from banks are required to keep large deposits in order to secure a credit line. To break this down a company might deposit $500k at a bank and receive no interest on their deposit. The bank then lends the business $1,000,000 at 8% on a credit line. In essence the bank is making the business pay 8% on their initial $500k to gain access to the second $500k. In Atlantic Bancshares’ case only 27% of their funding comes from non-interest bearing deposits. As one walks down the categories of deposits the deposits become more costly. An interest-bearing checking account might pay a small amount of interest whereas a CD pays a might higher interest rate. You’ll notice that most of Atlantic’s funding comes from interest bearing sources, money market accounts, and CDs. The income statement is where we see the interest mechanics at work. The bank took in $4.4m in gross interest from loans and interest paid on their marketable securities. They paid out $1.08m to depositors holding CDs and money market accounts. The bank then earmarked $1.86m as a provision for loan losses. This means the bank is expecting to lose $1.86m or more on loans and they’re saving this money ahead of time to deal with the problem. After the bank pays out its depositors, and provisions for losses they are left with their net interest income. After that is non-interest income, this is where things like overdrafts and one time investment gains are classified. When you re-order checks and are surprised to learn they cost $24 that fee appears in this category on the bank’s financial statement. Compared to the balance sheet a bank’s income statement is very straightforward. Expenses are itemized at a detail level that’s unusual for a non-financial company. 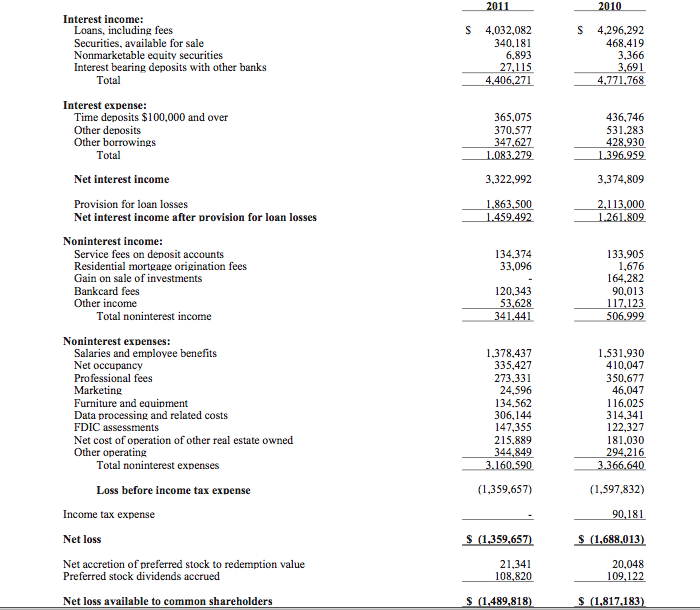 What I like about the income statement is it clearly shows the drivers for a bank’s profitability. A few quick calculations can be made, take the interest from loans and divide it by the loans outstanding and you can see the interest rate on the bank’s loans. Take interest expense and divide it by deposits to see what the bank’s paying on deposits. Most of a bank’s profitability hinges on two components, their expense management, and their interest margin. If the net interest margin is too small because they have a high cost funding base they will struggle to maintain profitability. Likewise if the bank’s expenses are out of control there will be no profit left for shareholders. Astute readers will note I left out two things, a discussion of loan losses, and any discussion of a cash flow statement. The cash flow statement isn’t as useful when analyzing banks as it when analyzing a non-financial. In a non-financial cash flows can be used to ferret out fraud, for banks other measures need to be used. Banking fraud does happen, but it requires a bit more ingenuity because banks are so highly regulated. The biggest risk to a bank investment isn’t fraud but stupidity. If a bank gets lazy and starts writing loose loans they will sink from lax lending standards quicker than anything else. The second point is much more important, the banks loan losses and trend of losses is vital in determining the safety of an investment. If the bank has too many non-performing loans they will either fail or be required to raise capital. The level of NPA’s is important, but the trend is just as important. I didn’t touch on this in too much detail because this isn’t a comprehensive banking guide, different investors have different NPA preferences, I prefer lower and safer amounts, but some people do well riding momentum as losses start to moderate. This entry was posted in Uncategorized on February 3, 2014 by ntobik.